Originally published in www.fastcompany.com on December 21, 2018. The marketplace for talent is changing rapidly, and experts say it’s about time the way we approached our own careers caught up. 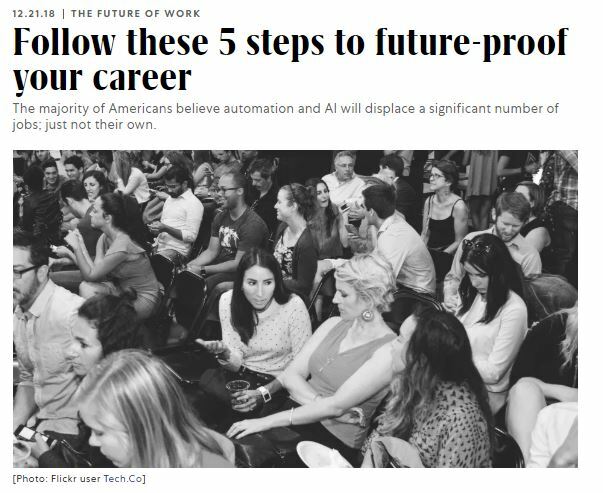 After a couple of decades defined by disruption, automation, and job displacement, many still aren’t convinced that their job could be at risk. 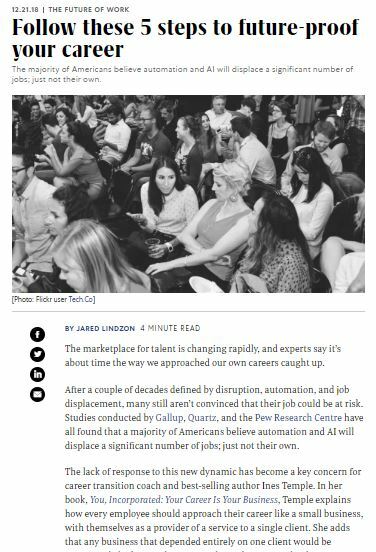 Studies conducted by Gallup, Quartz, and the Pew Research Centre have all found that a majority of Americans believe automation and AI will displace a significant number of jobs; just not their own. The lack of response to this new dynamic has become a key concern for career transition coach and best-selling author Ines Temple. In her book, You, Incorporated: Your Career Is Your Business, Temple explains how every employee should approach their career like a small business, with themselves as a provider of a service to a single client. She adds that any business that depended entirely on one client would be aggressively looking to diversify, and in today’s career landscape, employees should be equally as proactive when it comes to exploring their own career opportunities. Temple and other career experts recommend taking the following five steps to ensure your career is prepared to overcome the challenges of a rapidly evolving talent marketplace. The first step in improving your career’s resiliency, according to Temple, is determining where you currently stand. She believes that those who are most prepared to evolve are those that love what they do, as they are often most willing to go the extra mile in order to continue doing it. Being too satisfied with your current employment, however, may also be a sign that you should be doing more to prepare for your future. “A very simple litmus test is: If you’re comfortable, you should start learning something new,” says Darren Raycroft, a partner with the Bedford Consulting Group, an executive search and talent management company. Raycroft explains that with the rapid pace of technological advancement, the value placed on many skills today lacks the longevity that comparable skills had in previous generations. “Those periods of comfort and normalcy are getting shorter and shorter,” he says. Raycroft recommends keeping an eye on relevant job postings—even during periods of comfortable employment—to better understand where your industry is heading, and what skills are in highest demand. In today’s rapidly changing employment landscape, it’s easier than ever to fall behind, especially if you haven’t recently updated your skills. Raycroft believes that in order to stay ahead of the changing needs of the talent marketplace, employees need to be proactive in updating their skills. “That ability to learn and use judgment has been and will continue to be necessary for success,” he says. Not only do those who take a break from networking risk weakening some of their existing relationships, but they can also begin to lose their networking skills. Temple emphasizes the importance of keeping those skills sharp and those relationships strong by building them in the low-pressure periods of career stability. Building that network often requires strong interpersonal skills, something that Temple believes is sorely lacking in most of today’s workers. “We really need to work on our warmth, our charisma, how much energy we give to people, because those things will make a difference between those who have a chance for a better career and those who don’t,” she says. Furthermore, if our most robotic and repetitive tasks are bound to be automated, those quintessentially human traits may soon become our greatest assets. Not only can mentors use their experience to help their mentees navigate a quickly changing employment landscape, but they can also help them develop some of those vital soft skills in a low-pressure environment. Jared Lindzon is a freelance journalist born, raised and residing in Toronto, covering technology, entrepreneurship, entertainment and more for a wide variety of publications in Canada, the United States and around the world. When he’s not playing with gadgets, interviewing entrepreneurs or traveling to music festivals and tech conferences you can usually find him diligently practicing his third-person bio writing skills.